The issue of ownership in today’s society is still highly prevalent. Throughout the world, there are countries making laws about cultural property and whether ancient objects should or should not be associated with the modern cultures of today. Some of the main controversies that are around today include the Elgin Marbles and Cleopatra’s Needle. The issue of ownership does not only lie with the controversy of whether the ancient artifacts can truly belong to any modern culture and where these object should reside now; there is also a question of whether these objects should be removed from their original position in which they were placed or if it is ethical or moral to move them to a more public setting. By taking an object out of its own cultural context, there is less of an impact of its true significance within the culture in which it was made. There is a problem with this stigma. If no object were ever taken out of its original placement, then the accessibility of these objects would be greatly reduced. That is the purpose of encyclopedic museums such as The Metropolitan Museum of Art in New York or the Louvre in Paris. They recreate, in a sense, the culture and context of these pieces so that they still maintain relevance as well as allow access to these pieces for public enjoyment and study. How does one determine ownership of an object that belonged to an ancient culture? Some determine ownership by discovery, some by modern regional boundaries, and some by the best price offered for that object. As an example, Cleopatra’s Needle will always technically “belong” to the Egyptians. The controversy nowadays is where the obelisk’s final “resting place” should be. There are many sides to this argument, which will be explored and analyzed. Among those arguments, the following are the main points: the artifact should remain in a museum within the region in which it was found, the artifact should be transported to an encyclopedic museum so that others may access and enjoy its cultural significance, or the artifact should not be moved from its original location in which it was left during antiquity. All of these arguments are valid in their own right in different ways. The concept of ownership should not be based on where or to whom the object belongs. There is no exact formula to dictate where an object belongs, it differs with each artifact and each situation; ownership of an ancient artifact should be dependent on the ability uphold the respect for the original culture as well as the ability of that location to preserve that artifact. In Chas. 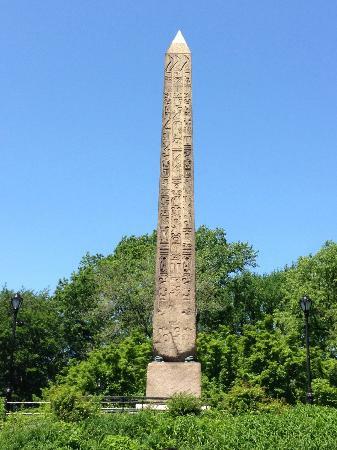 Chaillé Long’s article, “Send Back the Obelisk!”, Long expresses his outrage over the relocation of Cleopatra’s Needle. He believes that the obelisk has lost its meaning because it has been taken out of its home, culture, and out of context to an area where it will not be valued as highly. This is a scenario in which the cultural significance is lost by the moving of an artifact. Long states, “It was the only monument within the limits of the city. It was a monument of Egyptian fame, Egyptian art, and bore the name of a celebrated Egyptian queen. In Egypt it represented a part of her glorious history. In America it is meaningless and senseless” (Long 412). Long is in favor, generally, of the idea to leave things where they were originally placed in antiquity. He had personal experiences seeing that particular obelisk during his time in the military in Egypt. Cleopatra’s Needle is significant to Long because, during his service, he was able to associate his permanence on Earth with the permanence of that obelisk. For him, seeing a monument which was rooted so deeply into both the ground of Alexandria as well as the Egyptian culture, Long felt as if part of the identity of the land was “rudely torn from its native shore” (Long 411) along with the historical landmark. If a location, such as an encyclopedic museum, desired to acquire an ancient artifact from another region or continent, the process of relocating the object is also something that should be taken under consideration regarding the question of modern ownership. If the artifact is fragile or likely to be mishandled, then the object’s relocation should be reconsidered. Many artifacts are in decay due to time and weathering, alone. In some cases, the transportation of an ancient artifact is highly irresponsible because it will only serve to reduce the life of the artifact further. Long mentions the crumbling nature of Cleopatra’s Needle in his article: “I remarked that Cleopatra’s Needle is fast crumbling away, and unless some heroic remedy is applied to arrest decay, it may not be preserved long enough to ask whether the ‘nation will last’” (Long 411). There is another side to this argument, though. Because artifacts are so often exposed to the brutality of the elements, the movement to a location where the humidity, temperature, and light exposure could be regulated could serve to extend the life of the object. That is in addition to the incredible advances in technology, which has allowed for these museums to restore these artifacts or generate recreations to offer the full impact of an experience that can no longer be offered by ruins and tatters. It is unlikely that a person can afford to visit every site of a major archaeological discovery from the ancient world. The aspect of accessibility of the artifacts to the public is another major advantage of these encyclopedic museums obtaining a form of ownership of these objects. The concerns regarding the loss of culture by taking an artifact out of its cultural context (removing it from its original location) are only in regard to certain artifacts. If possible, one may attempt to acquire the Great Pyramid at Giza, but the pyramid would lose its impact if it were taken away from the location at which it resides. Though if it were an artifact like one of the several figurines of god Osiris, its relocation would hardly diminish its significance. In James Cuno’s article, “Culture War: The Case Against Repatriating Museum Artifacts”, he argues that the artifacts belong to everyone who wishes to enjoy them. Cuno says, “By presenting the artifacts of one time and one culture next to those of other times and cultures, encyclopedic museums encourage curiosity about the world and its many peoples” (Cuno 120). The advantage of encyclopedic museums allows the audience to be transported through different times and cultures by viewing the creations made at that time without having to be present at the original location. It is not a simple task to effectively convey the significance of an ancient culture, and it would be impossible to do so without some of the artifacts. While the museum is the place where the artifacts reside and are considered to be the property of the museum, “cultural property should be recognized for what it is: the legacy of humankind and not of the modern nation-state, subject to the political agenda of its current ruling elite” (Cuno, 120). The word “property” is what makes people uncomfortable, when it really only means where the artifact will reside. There will always be a certain ambiguity that comes with the concept of modern ownership over ancient artifacts. As long as the artifact remains in tact, respected, and still culturally significant, then there is no reason that an encyclopedic museum should not be able to acquire it so that it may be accessible to the public. By allowing these objects to be available to the public, it promotes the public to take an active interest in the history and culture in which the artifacts represent. This increased curiosity encourages the pursuit of careers in the fields of history, art, and archaeology so that the tradition of creating great works and accurately recording these works will continue. The controversy over modern ownership is not really a controversy at all. The artifacts will forever belong to the ancient cultures and peoples to which these objects originated. Upon making these available to the public through the means of an encyclopedic museum, the public now has accessibility and partial ownership of these works because their active interest funds the development, research, and preservation of the artifacts and their exhibits. Cuno, James. “Culture War.” Foreign Affairs 93.6 (2014): 119-129. Business Source Premier. 3 Mar. Long, Chas. Chaillé. “Send Back the Obelisk!.” The North American Review 1886: 410. 3 Mar.